Two versions of ZEPPELIN shoes will be made available. First up, the Era features a black leather upper emblazoned with the symbols featured in the album art for "Led Zeppelin IV". Second, the Sk8-Hi features the image of the Hindenburg from the band's eponymous 1969 debut. The will also be what looks to be two Vans x Led Zeppelin t-shirts and a baseball cap. Guitarist Jimmy Page explained that, quite simply, LED ZEPPELIN was built to stand out from everything that came before and after it. "When I formed LED ZEPPELIN, I formed it with the idea and the ethos that it was going to change music. That's what I wanted it to do — and it clearly did. And it brought to the forefront these master craftsmen that were involved with that band." 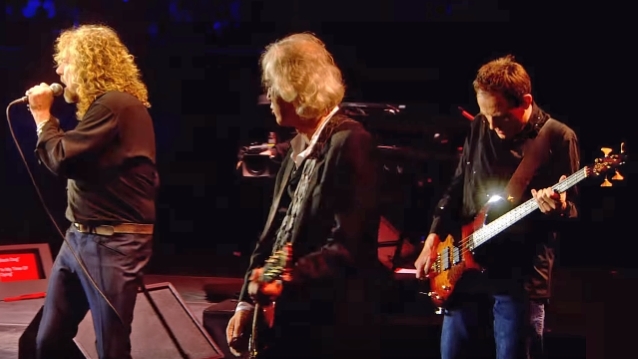 Page told The Pulse Of Radio that ZEPPELIN's initial influences from across the Atlantic solidified the type of music they would create over the years. "The fact is, all four of us, were so influenced by American music, and for me, the music that I was hearing in the sort of '50s over here, it was all a reinterpretation of what was going on in America. So we, sort of, had this American music, sort of coming in to us, and we were accessing it through the radio and records. That's a major part of why we became what we were — which is musicians and became totally seduced by this whole movement in music."